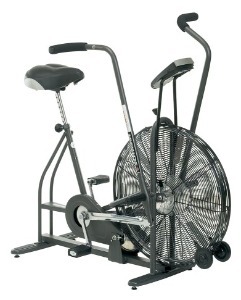 The legendary Schwinn Airdyne upright exercise bike is a total body ergometer for fitness and rehabilitative use. The difference in the Airdyne from standard stationary bikes is the patented fan wheel technology that exponentially increases the resistance the harder you pedal. This commercial quality bike is ideal for novices and athletes alike. The Schwinn Airdyne upright exercise bike has a comprehensive computer console which tracks time, distance, calories, calories per hour, heart rate, RPMs and more on an easy-to-read LCD display. The workout can be set for different elevations based on air density at different altitudes. UPDATE: The AD4 has been replaced by the popular Schwinn Airdyne AD6 exercise bike. Check out our review. Instead of using a magnetic ECB flywheel like most exercise bikes have, the Schwinn Airdyne upright exercise bike uses a large air-resistance flywheel. There are no resistance levels to set, per se, since the patent Air Resistance Technology is graduated and exponential. As you pedal faster, it gets harder; if you tire and pedal slower, it gets easier. There is no adjustment to make on the console; the resistance is all determined by pedaling speed. As for the mechanics, the friction-free braking system is virtually maintenance free and the quiet drive train has sealed cartridge bearings to ensure an extra long life. Another benefit of the Airdyne upright exercise bike is that, as you pedal harder, more air is blown by the open flywheel providing a strong breeze to cool you down. That’s right, the flywheel provides both smooth resistance as well as working as a fan! It keeps you cool during the workout by blowing controlled streams of cool air. Of course, that also means it will blow away any papers and newspapers lying about in the room. Also, the airflow is noisy, making it hard to watch TV or talk during the workout. The moving arms are synchronized to your leg movements for a natural upper body motion during the workout. Contact HR sensors are mounted, and optional telemetry heart rate monitoring (wireless chest strap) is available. Best of all, unlike other stationary bikes with magnetic resistance, the console works independently so even if the batteries to light the display are dead and the console readings go dark, you can continue pedaling at your desired resistance level. As you may already know, reviews on the Schwinn Airdyne upright bike are excellent. The reputation and longevity of the bike is like nothing you’ve ever seen. Users proudly boast how old their Airdynes are ... 12 years, 15 years, 22 years ... and still in use, having logged thousands of miles ridden. Who knows how long these quality exercise bikes can go? The solid steel frame and quality components don’t malfunction or need repairs, and here’s the crucial point; the design hasn’t changed in all these years so you shouldn’t worry about buying one this year and then seeing an “all new and improved” Airdyne two years from now. That isn’t going to happen. Schwinn isn’t going to mess with success. For durability and reliability, and a value-strong price of $625, nothing beats the classic Schwinn Airdyne upright exercise bike. The Airdyne will likely stay on Best Buy lists for many years to come. Highly Recommended.